Questo itinerario combina i più famosi relitti del Mar Rosso settentrionale con splendida parete e duro barriera corallina giardino immersioni. Immergetevi con noi nei famosi quattro relitti di Abu Nuhas , Cimitero delle navi . Questo reef si trova vicino alla nave corsie verso il Canale di Suez e ha rivendicato più navi di qualsiasi altro nel Mar Rosso . I relitti sono molto panoramica, coperta di coralli e sono fantastici per la fotografia , in particolare il Carnatic , dopo aver affondato nel 1869 . Il famosissimo Thistlegorm e il recentemente scoperto Rosalie Mueller sono relitti della seconda guerra mondiale e uno dei punti forti di questa crociera . Il Thistlegorm affondata nel 1941 , dopo essere stato bombardato dai tedeschi durante una missione per consegnare un carico di munizioni e di materiale bellico alle truppe britanniche in Nord Africa . Il Rosalie Mueller , un carico di carbone britannico , ha subito la stessa scomparsa solo due giorni dopo . Questa crociera ti porterà a Ras Mohamed National Park sulla punta del Sinai , famosa per le sue mura mozzafiato ricchi di coralli molli e ventilatore e popolate con enormi banchi di pesci . Sedimenti ricchi di nutrienti dal Golf di Aqaba attirano molte specie di pesci e alimentano anche i polipi corallini creando un paradiso per i subacquei . Potrete anche visitare le barriere coralline al largo di Hurghada , che sono molto ricchi e di ampio respiro . Una varietà di pareti colorate e giardini di coralli duri con un sacco di pesci colorati li rendono ben vale una visita. Being so close to its neighbor, the Thistlegorm, this large circular reef is often overlooked. It offers excellent diving on pristine coral from any location on its perimeter. The sheltered southern point is the most dived location offering the opportunity for drifts along the west or east sides. Weather permitting the northern point hosts the wreck of the Kingston ('Sarah H') just below the surface (max. depth 12m). Large schools of yellow goatfish, sweet lips abound here and the area regularly patrolled by gray reef sharks. In October 1941 she was at anchor behind Shab Ali and awaiting orders to move up through the Suez canal to deliver a cargo of munitions to the British troops in north Africa when German aircraft bombed the 129m British freighter. The cargo is still virtually intact and includes railway locomotives, bren gun carriers, trucks motorcycles and a host of ammunition of all sizes. That's the best place for extensive wreck penetration. The wreck is home to bat fish, jacks, barracudas, surgeon fish. This wreck lies in the channel north of Gubal Island and is a dive only for the more experienced as the visibility can be reduced and the wreck swept by strong currents on occassions. She was on her way to Alexandria with a cargo of coal when she was sunk by German aircraft on the 7th October 1941, just two days after the Thistlegorm. Originally named the Francis she was launched in 1910, she was then purchased by the Moller Line in 1931 and renamed after the grandchild of one of the company directors. The wreck is in pristine condition, and home to prolific fish life and a magnificent array of hard and soft corals, she is 108mts long and sits upright on an even keel with the bow at 39mts and the keel in 50mts. The top of the mast is at 17mts. She is rarely dived due to her position and can only be accessed in the best of weather. Also known as the 'Ships Graveyard', this reef is dangerously positioned close to the busy shipping lanes of the Gulf of Suez. This reef has claimed more ships than any other in the area. On the north side are four wrecks laying on a sandy seafloor at the bottom of a steep sloping reef layered with table corals. The wrecks are sometimes inaccessible in anything other than a RIB or inflatable due to the heavy swell driving down the length of the gulf. This Greek freighter hit the reef in April 1983 and over the course of two weeks slowly broke in two and sank. She is the most dived wreck here, Laying in 28m and leaning to port with a fully intact stern section and an impressive engine room packed with glass fish. Locally known as the 'wood' wreck for the cargo it was carrying when it sank. The bow is also very interesting but is a long swim out. She is a great wreck for penetration but beware of disorientation due to the angle at which she lays. Be weary of the many lion fish and scorpion fish that call this wreck home, and watch out strong surges in and around the wreck in rough weather. A British P & O steamer which struck the reef in 1869, and sank the next day as the weather worsened. She was a passenger and mail ship and is sometimes known as the 'wine' wreck for the numerous bottles once found in the holds, sadly not many now remain to be seen. Rumor has it that she sank with forty thousand pounds sterling of gold bullion, much of which was never recovered. She lays in 29m and now the whole hull is draped in multi-coloured soft corals and the inner areas are full of glass fish complete with red mouthed grouper sentinel. One davit supports a beautiful table coral. The wreck is now home to large grouper, octopus and morays and jacks and tuna cruise overhead. Another Greek ship which sank in 1976, now laying in 30m is fully laden with stone floor tiles and sometimes called the 'tile' wreck for obvious reasons. Early morning divers may find a white tip reef shark sleeping under the rudder at the stern. Be weary of very limited and small entry/exit points into the engine room, however, penetration of the wreck has to be done with extreme care due to the unstable nature of the wreck. Sunk in 1881 this British cargo ship was sailing from London to Aden when she ran headlong into the reef. Lying in 16m of water she is covered with hard coral growth.The stern complete with rudder and prop are intact and the remains of the hull have attracted an enormous amount of fish life, small schools of barracuda hang over the stern and jack patrol the area. The wreck is misnamed in a lot of Red Sea guides as the Sarah H, rumour has it that the wreck was named after a divemaster on board at the time it was discovered. Laying in 10m close to Shab Ali and its famous wreck the Thistlegorm this wreck is largely ignored. She sank in 1926 and was a mixed steam and sailing vessel and the four boilers can be seen today together with the prop shaft. The bow and stern are still reasonably intact but the midships is well broken and is mainly a debris field. The whole wreck is covered in hard corals and very active reef life. This is an excellent location for photography but watch for the current which runs from bow to stern and can be strong. This ship was on its way from London to Penang when it foundered on the north shore of Gubal island in August 1887 and sank on the coral slope with her bows still above water and the stern lying in 29m. The midships and aft sections are accessible with care and the remains of her general cargo remain inside. Within the wreck there are branches of delicate black coral so care should be taken not to disturb these. The wreck is swathed in soft corals in a myriad of hues, the bow has its resident glass fish and attendant lion fish on patrol duty. Scorpion fish are abundant throughout the wreck. And the shallow parts are teeming with surgeons, tangs, antheas and triggers. The whole wreck is great for photographers but watch out for the strong current that can sometimes sweep the wreck. Not a lot is known about this wreck except that it struck the reef in 1981 and is locally known as the 'lentil' wreck for the cargo she carried. Lying in 31m and completely on its starboard side exposing its huge hull on one side and gaping cargo holds on the other. Growth on the hull is fairly sparse due to the position and current. Large morays live in the scattered remains of wreckage on the starboard side and batfish circle the topside. Most of the fish in the vicinity of the wreck are overweight from dining on the lentils leaching from the sacks once contained in her holds. A large horseshoe shaped reef that shelters a shallow lagoon and offers good shallow diving on coral gardens at either point. Further around the southern reef exterior provides a steep coral encrusted wall sloping to 40+m. Playful bottlenose dolphins are found inside the lagoon at times. 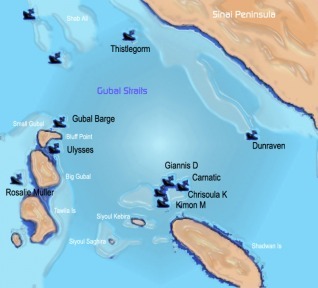 An Isolated reef south of Siyul Island, with good diving on its north side. Soft coral, sea whips, many ergs home to glassfish and turtles can often be found here. This reef extends around the Island of Big Siyul and has a varied profile, in some areas sand chutes (wadis) split the reef face, in others there are overhangs and gullies to explore. The coral growth is abundant as is the fish life. Most diving here is in swift currents on the drift but the north eastern point offers a plateau which slopes gently from 10m to 30+m. Sharks and large rays are often sighted in the deeper water, with schools of sweet lips and masked butterflies in the shallows. Despite it Arabic name Little (Seghira) Siyul is the largest reef in the area at over 4km long. It is usually dived as a drift due to the strong currents along the sloping reef. The depth range is 20-25m, the corals are lush and vibrant and the fish life is dense and varied. The best dive here is along the north side but can only be done in moderate weather due to the exposed nature of the reef. At the gate of the Straits of Gubal, 'Bluff Point' draws its name from the turbulence created by strong currents that beat the eastern most wall of the island. Huge fan corals cover an impressive drop off with caves and glassfish. Sightings of turtles and napoleon fish are not uncommon. An unknown wreck lies on the reef 300m north of the lighthouse, starting at 5m depth and sloping to 25m. Rumor has it that this is the wreck of an Egyptian patrol boat sunk in the 6-day war.